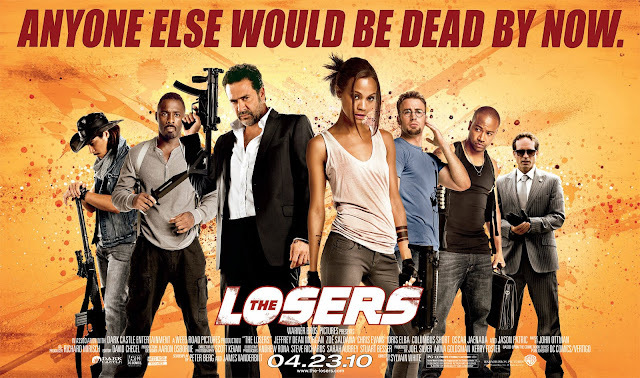 Based on the Vertigo comic book series of the same name, The Losers is a film about a team of 5 ex-special forces members hunting down a man only known as Max (Jason Patric) who betrayed them and framed them into becoming enemies of the state. Max is also in possession of some high-tech equipment capable of destroying countries... blah blah blah you get the picture. Jason Patric did the worst portrayal of a villain I have ever seen. It was so frickin painful to watch and it absolutely ruined this movie. He is what stood in between turning this into maybe a three and a half star movie. The "Losers" and Zoe Saldana (Avatar) played their parts well enough in an action movie where the fight scenes, explosions, special effects and comic relief make it what it is. The dynamic between Clay (Jeffrey Dean Morgan) and Roque (Idris Elba) as leader and best friend was excellent. Both did really well with their parts. I'm a big fan of Idris Elba from his days on The Wire and Jeffrey Dean Morgan (Watchmen), who kind of reminds me of Javier Bardem was very cool. I'm gonna finish with the villain again though. Jason Patric ruined this movie. I could think of 10 actors that would have done a better job and would have cost the studio the same amount of money. Mark Strong to name one. If you can get past a douche bag performance from one guy, you'll enjoy this movie enough for it not to be a waste of time. Otherwise watch something else.